How to Print Electronic I-94, How to Return a Paper Format Form I-94 Arrival and Departure Record from the United States, or What to do if the form I-94 has been lost. 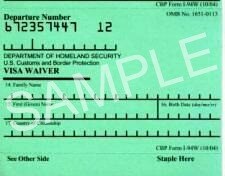 DISCLAIMER: U.S. Immigration forms are available free of charge at official government websites. We are not affiliated with the government, we are a private publisher. We don't sell forms, we provide Information Packages with instructions and information about the US Immigration Process, providing help on how to complete and submit forms, and general immigration information. Answer to frequently asked questions about the Form I-94 Arrival Departure Record. Questions and Answers about Arrival, Departure and Length allowed to stay in the U.S. There are several types of visas depending on the purpose or type of travel. In general visas are divided in two main groups: immigrant visas and non-immigrant visas. Immigrant visas are visas that allows you to travel to live permanently in the United States and are also known as “Green Card” or “Permanent Residence”, then the other type are the non-immigrant visas that are more commonly known just as visas in general. A non-immigrant visas doesn’t give you the right to stay permanently in the U.S., these visas are issued for the purpose of one or multiple temporary short trips to travel as a visitor to the United States, for example the B-1 Business Visa or B-2 Tourist Visa are classified in this group of non-immigrant United State visas. You must stay inside the U.S. only for the time allowed by the immigration officer at the point of entry as it was stamped in your passport and registered in your Form I-94. In the case of travelers entering the U.S. by air or water, travelling under the Visa Waiver Program, the I-94W is not longer in use, instead the ESTA system is keeping record of entry and exit. It is important to understand the difference between the expiration time of the actual visa and the time allowed to stay inside the US when traveling with the visa. Green Card holders are not subject to the form I-94 because they can stay in the U.S. indefinitely, as long as their resident status continue being valid. A visa gives you the right to travel to the U.S. but is actually the immigration officer at the port of entry who decides if you would be admitted for entry in the United States, and for how long you are admitted to stay in the U.S. in such trip. Travelers by air and sea no longer need a paper I-94, instead they will be using the Electronic I-94. If you travel under the Visa Waiver Program then your entry is registered using the ESTA travel system. Wen traveling by land (from Mexico or Canada), the immigration officer will write the date you entered the country and the latest day when you have to depart from the US in a white form called I-94 Paper format, this form is used when you travel with a visa, US Immigration will keep a portion of the form, and you should keep another portion with you and keep at all times during your trip with your passport. What is the form I-94 Arrival-Departure Record? How to print an electronic I-94? How do I know until what date I am allowed to stay inside the US.? 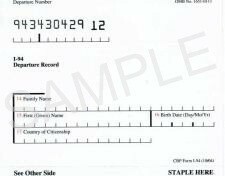 I forgot to return my I-94 Departure Record when exiting the U.S., how can I return the I-94 to the U.S. from out of the country? How to find official forms and instructions? How to avoid to have problems when entering the U.S. after a previous trip in which I forgot to return my I-94. Order this guide to find out more information and answer to visa questions, requirements, general information about the record of arrival and departure from the U.S.